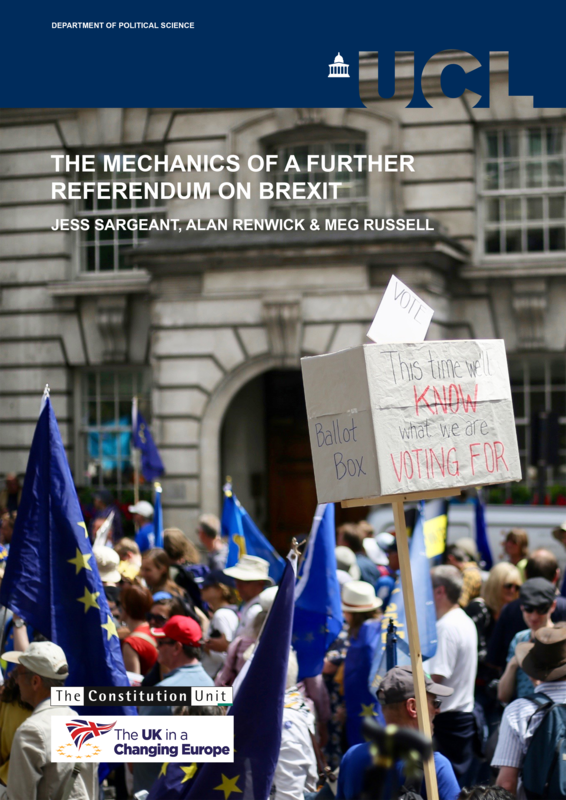 As explored in a previous post, various factors have combined to make parliament’s Brexit dilemma unique. The most important is the context provided by the June 2016 referendum. By voting for ‘Leave’, the British public issued an instruction to government and parliament, which went against the prior views of most MPs. 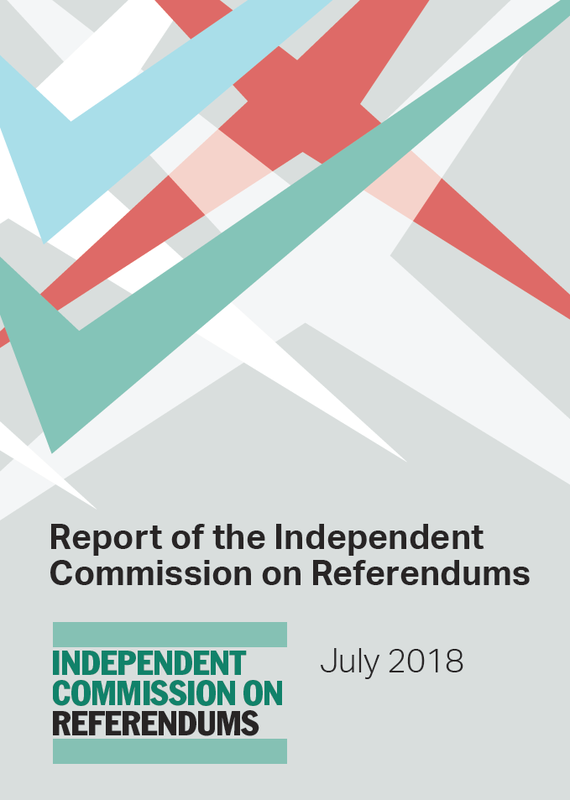 Politicians pledged to honour the referendum result, but as pointed out by various key actors (including the Commons Public Administration and Constitutional Affairs Committee, chaired by a leading Brexiteer, and the Independent Commission on Referendums), the instruction was far from clear. As we now know, there are many different competing visions of Brexit from which MPs could choose. To complicate matters further, Theresa May’s snap general election of 2017 delivered a hung parliament and minority government, making it far more difficult than usual for parliamentary majorities to form. While the Prime Minister pointed the finger at parliament for its inability to agree, many have noted how her own choices, and her particular political style, have contributed to the problem. Both before and after the 2017 election, she showed no recognition of the need to work with other parties (aside from the Northern Ireland DUP) to deliver a Brexit deal. In her Lancaster House speech she set out ‘red lines’ designed to keep her most ardent pro-Brexit MPs on board, which made other coalitions difficult. Throughout the process, she has seemed to act tactically rather than strategically – focusing on keeping her own party together day-to-day rather than building a broader national consensus. In a minority government situation this has been particularly problematic. Meanwhile, the pro-Brexit ERG have turned increasingly away from compromise. To secure a deal with the EU while maintaining peace and security in Northern Ireland, several elements were included which have angered this group. The most discussed is the Northern Ireland ‘backstop’. This was coupled with the political declaration’s promised ‘customs arrangements’ with the EU, designed to ensure that use of the backstop can be avoided. ERG members dislike this, and dislike the inclusion of a transition period, which would tie the UK to EU rules until at least December 2020. Many would rather cut free, even if that meant no deal. The Prime Minister’s parliamentary handling has mostly seemed geared to keeping, or bringing, Conservative hard Brexiteers on side. But they have consistently rejected her deal. Though heading a minority government, which patently lacks support even from a lot of its own MPs, Theresa May has consistently behaved as if she led a majority administration whose MPs can be expected to be acquiescent. It seems that she has swallowed the line (much propounded in the past by journalists) that the government controls the House of Commons. In fact, though often not very visible, the relationship was always the other way around. If government and parliament agree in normal circumstances, that has flowed from both being drawn from the same majority party (with any differences generally ironed out behind the scenes). Leading a minority government is different. It requires a far more flexible, nimble approach, including the ability to compromise and to work cross-party. Theresa May clearly has none of these skills. Many of her EU partners, who more often face such circumstances, seem to understand the current UK dynamics far better than her. Applying this mindset, the Prime Minister’s engagement with parliament has been grudging. Her wording of motions (including on no deal on 13 March, and an extension on 14 March) have appeared designed to manipulate and trap MPs into supporting her solution, rather than to facilitate open decision-making. Even when motions have been agreed, the Prime Minister has clearly been disinclined to honour them – leaving ‘no deal’ on the table even after it was defeated on both 29 January and 13 March, and requesting a short Article 50 extension (in the absence of agreement of her deal) despite parliament’s instruction on 14 March to ask for a longer one. Her resistance comes, in significant part, from the fact that these instructions were issued by the Commons on a cross-party basis, not by her party. Indeed, a majority of Conservative MPs voted against extending Article 50, leaving support for this government motion dependent on Labour votes. Subsequently, May found herself unable to get Cabinet support for a lengthy extension. In her ill-judged statement to the nation on Wednesday, the Prime Minister blamed MPs for the fact that ‘motion after motion and amendment after amendment has been tabled without parliament ever deciding what it wants’, adding that ‘all MPs have been willing to say is what they do not want’. This was plainly disingenuous, given the government’s failure to present MPs with any alternatives, and its organisation of both timing and wording of motions to as far as possible block such proposals. Nonetheless, events have certainly shown some of the challenges of parliament organising decision-making without government support. The government by default controls most time in the House of Commons (under Standing Order no. 14). This has made it difficult to mobilise MPs behind alternative solutions. Meanwhile, although party cohesion is partially disintegrating, MPs still tend to default to following the whip – as Conservatives did when ordered to vote against Hilary Benn’s amendment on 14 March to seize control of the agenda. In normal times, leadership in the House of Commons comes from the political parties (and particularly from the government), and when that is lacking it is very difficult for other members to adequately organise amongst 650 MPs. Even senior backbenchers lack the communication channels, and organisational resources, available to parties through their researchers and whips. Agenda control, dispersed leadership and lack of established organisation have all made it difficult (particularly in the face of government opposition) for MPs to organise themselves. In the coming days, these difficulties somehow need to be overcome. But it must be recognised that this is challenging, and MPs must take very careful decisions. A new amendment from Oliver Letwin, Dominic Grieve and Hilary Benn has now been tabled for debate on Monday, which would dedicate Wednesday to debating a series of Brexit options. Precisely how these arrangements would unfold remains to be specified. This section sets out some thoughts, and some warnings. For months there has been talk of holding a series of ‘indicative votes’ on the different Brexit options. This now looks set to occur, facilitated either by the government or through agreement of this very widely-supported new cross-party amendment. Faced with likely defeat on the amendment (the previous Benn amendment having been defeated by just two votes) the government may choose to make time for such a debate. But unless the government’s prior attitude of manipulating the options changes, MPs could again end up frustrated. Meanwhile, the challenges of MPs themselves ‘taking control’ are very great, for reasons already given. Even senior MPs do not have the mechanisms of organisation and coordination usually available to governments. This creates a risk of a chaotic set of options which do not facilitate a clear choice. The Speaker, who has already stepped up his role to try and gain control of the process, could have a key part to play in selecting and ordering amendments – but this could be both controversial, and have unpredictable consequences. A wide range of options have previously been proposed for decision by indicative vote. Several further challenges apply to organising these options. First, if decisions are taken on a yes/no basis on a series of propositions (as is the Commons norm), no option may gain a majority. 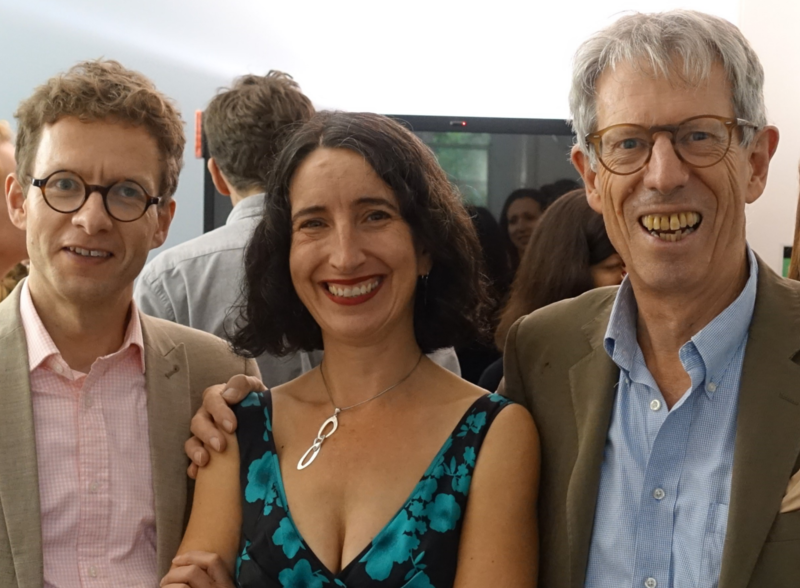 The well-known case of such indicative votes, which signally failed, is those on Lords reform in 2003 – when all the available options were defeated. Second, MPs may use procedural tricks and not vote sincerely. One reason for the 2003 failure was a group of MPs voting against all of the options in order to scupper the process. It is easy to imagine some MPs using similar tactics on Brexit. Third, and importantly, the options available to MPs are multidimensional rather than lying on a single spectrum. For example some may support the Prime Minister’s deal, or some alternative deal, only on the condition that it is put to a referendum. This has led Jack Simson Caird, Alan Wager and Matthew Bevington to suggest that a referendum might be left out of the options. But given some MPs’ views, its inclusion could be vital to getting an outcome agreed. One proposed way (e.g. by Kenneth Clarke and others) of organising the question is to offer preferential voting. This method is already used for election of select committee chairs. It would avoid the problems of the yes/no voting system, and encourage sincere voting. But it would not on its own address multidimensionality, and the impossible dilemmas that could present MPs. Hence such ballots need to recognise that there are two primary dimensions – and treat them separately. On each dimension, options should meet three key criteria: they should be as simple as possible, should be practically achievable, and the set of options should be mutually exclusive and exhaustive (meaning all options are covered, and no options overlap). On this basis, two separate ballots might be held. These options are mutually exclusive and exhaustive, and in practice all are clearly achievable. Arguably the last of these options could be omitted, having already been rejected by the Commons in two previous votes. These complexities need careful thinking through, rather than leaving to chance through uncoordinated motions or amendments. One way of achieving this could be agreement of a cross-party motion setting out the suite of options, supported by all of the key players – with no amendments to be accepted. Agreement of a text might be brokered under the auspices of the Speaker, or potentially the government (if problems of mistrust can be overcome). In any scheme the risks of ‘gaming’ the system, and the particular dilemmas facing MPs holding different points of view, need taking into account. Most commentators now anticipate that such motions will be taken on ‘free votes’, without the application of the whip. That seems both necessary and desirable. If the Commons can find a procedure to reach agreement, it will need to rely on the government to respect this and carry it through. Ultimately, the House of Commons holds the power – and hence the threat – of removing the government from office should it not deliver. That threat now seems more real than it was when Jeremy Corbyn triggered a vote of no-confidence in January, given the mood of some Conservative MPs. Hence it could actually be deployed, either if the government sought to manipulate and block decision-making, or if the government did not respect the results of such decision-making by MPs. It should be remembered that under the terms of the Fixed-term Parliaments Act a vote of no-confidence does not immediately result in a general election, but triggers a 14-day period during which a new government can be formed. Already, calls are growing for Theresa May to step aside and make way for a ‘caretaker’ Prime Minister. Whether forced by a confidence vote or other means, there is no necessity that any new Prime Minister be one of the party leaders. Instead it would be crucial for them to command the Commons’ confidence – beyond the narrow confines of the Conservative Party – to deliver the next stage of the Brexit process. Professor Meg Russell is Director of the Constitution Unit. 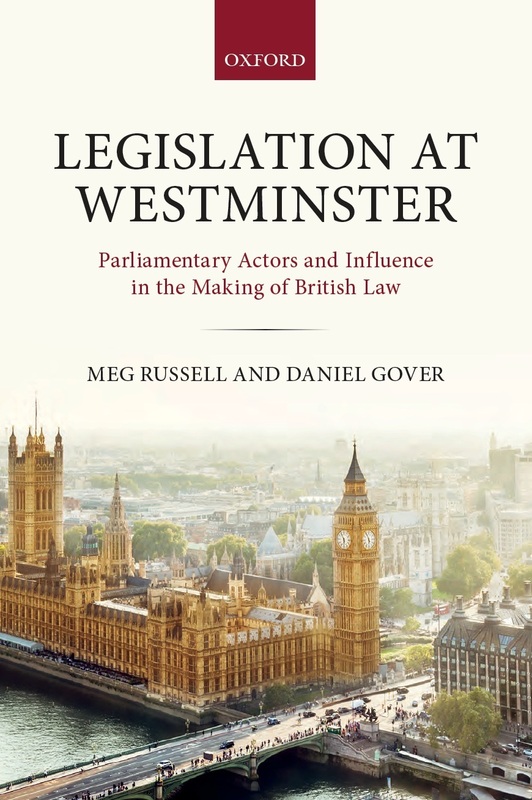 Her latest book, Legislation at Westminster: Parliamentary Actors and Influence in the Making of British Law (with Daniel Gover, Oxford University press, 2017) is now available in paperback. 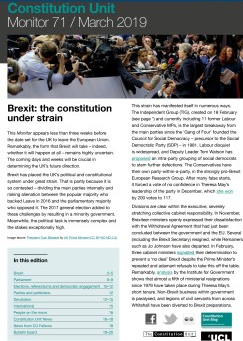 This entry was posted in Brexit, Devolution, Europe, Parliament and tagged 2017 general election, Article 50, Brexit, Conservative-DUP agreement, Dominic Grieve, DUP, ERG, European Research Group, fixed-term parliaments act, free vote, Further referendum on Brexit, H, Hard Brexit, Hilary Benn, House of Commons, Indicative Vote, Irish backstop, Ken Clarke, Lancaster House speech, Legislation at Westminster, meg russell, minority government, no deal Brexit, Oliver Letwin, parliament, preferential voting, prime minister, second referendum, Speaker of the House of Commons, Standing Order 14, vote of no confidence, withdrawal agreement. Bookmark the permalink.